Have at it, then. I've recently read the Du Maurier biog, so curious to see how this polls out. Jane Eyre > Wuthering Heights. That's all I've got to go on. I have no dog in this fite. I really need to revisit the Tenant of Wildfell Hall because it's been like 20 years since I read it, but I unexpectedly fell in love with a television adaptation of it recently, which might sway me for Anne. Notwithstanding that, I'd probably go for Charlotte. It's marvelous! I reread it last spring. I remember it as wonderful! And one of the most evil (yet reformable) rakes in literature. (Played by Rupert Graves in this adaptation, so, um, that might have helped.) But I am much older than when I first read it, and fear childish tastes may change. In some ways it's superior to Jane Eyre; she uses the epistolary form to shrewd effect. I need to re-read Wuthering Heights. I feel like it's the right winner – real high eerie weirdness, broken & brilliant narrative structure – but I haven't looked at it in an age, and I have always loved Jane Eyre, sad voice talking to itself, flat life pierced by odd, angry fairy-tale wish story. & that still stands - so I think my vote is Charlotte - there's a tone she has that I love. That said I reread Emily's poetry last night bcz of this poll & I'd forgotten how it kicks - looks a bit like straight Victorian melancholia but is this super intense verse from a cloistered death-world. Started Wuthering Heights too – haven't read it since I was 18 or so – and thought it the best thing ever within 5 pages: Lockwood being a total dope, really creepy breakdown of social rules, domestic animal attacks, "gaunt thorns all stretching their limbs one way, as if craving alms of the sun". I've always suspected I read it too young, or came at it badly – should commit to this reread. Anne, I've only read the Tenant, no real memory of it. Branwell… I have read a few of the Horace translations I think, but not in the running obvs. I put in Branwell because he's such a curious character, and as I said, have recently read Du Maurier's book. (And every time she - or he - described his "Infernal World" I just felt complete "OMG yes" because Branwell is in many ways the archetypical Fan Fiction writer who cannot escape their source material.) But don't really consider him "for the running" as it were, except through some perverse choice, but mostly because I really wanted Fizz to expand on his adolescent fascination with him, because he is kind of a fascinating character. I rather have the opposite approach to Wuthering Heights, in that I recall reading it when younger and being captivated by all the gothic super-intensity, but attempting to re-read it about 5 years, ago, I felt a bit "oh come on." (And I'm usually a big fan of Victorian lugubriousness.) That might just be over-familiarity with the narrative at this point and if I approached it with a fresher eye I'd feel more disposed to it. I've not read any of them since my teens, I think, and never read anything by Anne, so this is a straight fite between Emily and Charlotte for me. Jane Eyre is probably the best novel of any of them but I really disliked Villette. I'm not planning on re-reading any of them any time soon so I'm going to go with heart rather than head and vote for Emily and her preposterous melodrama. I wasn't ready for Wuthering Heights when I read it in high school. It might have been my first attempt at 19th century literature, I can't remember. Since then I've been bowled over by comparably dirge-like things like Ethan Frome and Anne Carson's Emily poem Glass Essay -- maybe it's time to have a second go. Wuthering Heights is my vote for best of their novels. Damn, is that a hateful book. "Hateful" is such a good word. Only 50 pages in, and The Tenant is even more wonderful than I remember. Voting Anne! But don't read her poetry. Also voting Anne, I think. I'll have to dig up my copy of England Is Mine; remember the take/gloss on Branwell in the 'Lucifer Over Lancashire': Billy Liar, Branwell Bronte, John Cooper Clarke, Mark E. Smith, and the North' chapter being decent. Haha, that Hark A Vagrant comic is excellent and pretty OTM. But it's also right, in that for all the glorifying of melancholy brooding arseholes that goes on in the other two's books, Anne provides a quite realistic counterpoint of "Look, I cleaned up Branwell's vom-stains, this is not glamourous, this is gross." Aw nuts, I'm sorry I missed this poll. 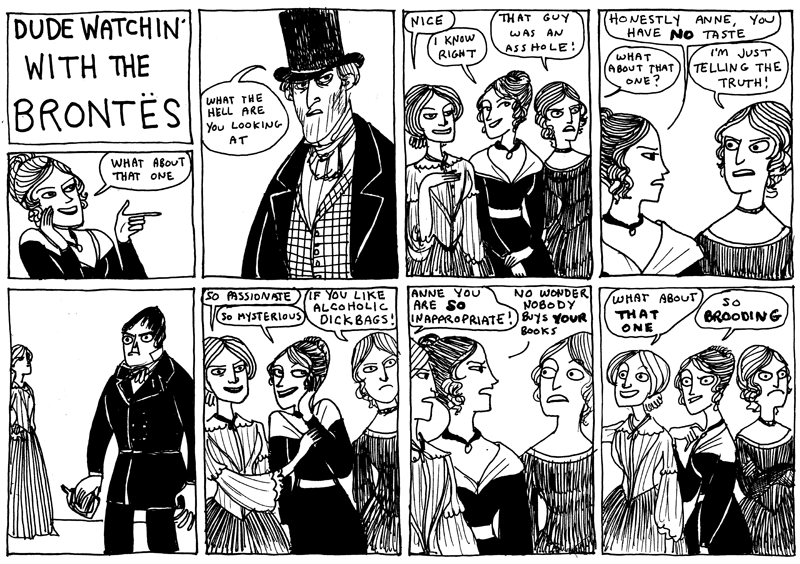 I love all the Bronte sisters, that Kate Beaton OTM with that comic, but would have voted Charlotte because Jane Eyre is one of my favorite books ever. Alfred OTM about the hatefulness of Wuthering Heights. I've always been annoyed when it gets categorized as a love story. What book are those people even reading? i just recommended to a friend on twitter that he read c bronte's villette, because lucy snowe is such a delightfully mean narrator, and then having been reminded of how much i love this book i have been sitting up re-reading it on project gutenberg, unable to stop. Can't believe 2 people actually voted for Branwell! This is p much the distribution I expected, but that surprised me. Didn't expect that red-headed rogue to get any votes. Glad I voted for Anne, though. Last night, while re-reading the scene in Tenant where Helen turned down Bore'em's proposal, I was simultaneously both air-punching and saying "You go, girl!" but also collapsing in giggling fits at the wit and sharpness displayed. It's a very funny scene, while also being very pithy, very much like the political bite under the frothy humour of Austen. I need to read Vilette next. I keep thinking I've read it, but I'm not sure I have. (God, I have come to love the Brontes, though, because they write women who *are* mean and spiteful and sharp and shrewish and incisive and all those things women are ~not supposed to be~ and still get to be the heroine of the story anyway without being reduced to 1-dimensional shrew stereotypes. That gratifies me so much. Reading women who don't have to be ~nice~ or be "likeable" all the time, women who get to be complex and complicated and multi-faceted, with good parts and bad parts, just like real human beings! Do we blame Charlotte for making Anne's work less known - as a result of her temporarily blocking further editions of Anne's second novel, leading to a mangled edition being widely read for decades ? Not that she's to blame for the mangled editition, Thomas Hodgson is, but that probably wouldn't have been the text followed if she didn't block the original in the first place. Reading the Glass Town/Angria/Gondal writings. Amazing – teenage ultra-high intensity flare outs of gothic/romantic noise – naive and absurdly over-gifted. Really strange tone coming from public figures/stories inserted into private shared world, w/ rumbling angst beneath. Feel like I need an all brontes, all the time phase. yes, the Oxford Classics. Bit steep (given I am generally reading the Brontes in a Delphi Classics kindle edition), but I felt like I hadn't been buying enough books lately. "is not an obsessive return to a private structure of feeling - the insistent "first-person stress" that Raymond Williams found in Brontë's writings - but an imaginative intelligance at work. Theirs is the 'seccentric' viewpoint of history's spectral others - those excluded from official narratives, without effective agency, those who have 'no claim'. The focus in each is on the private experience of a solitary individual, unable to shape or even to understand the world in which she finds herself; the perspective not that of the authoritative, but of the uncomprehending, the situated, embodied gaze. 'I looked up,' says Lord Charles in 'Strange Events','and thick obscurity was before my eyes':'the returning sense of sight came upon me,' says Lucy,'red, as if it swam in blood' (Villette 165). Yet in each there comes also into focus the quite distinctive outline of that which the narrator confronts. And the presence of that looming other, impenetrable or impervious, points, it is beginning to seem, to their author's imaginative concern with a 'most real and substantial' world." Two hour biopic for BBC. I'm pleased Sally Wainwright is doing it, and super excited in general, but fear I'll be the fanboy nitpicking and whining. The story is almost too perfect for a biopic so if they mess up or leave out some of the very much Hollywood-worthy scenes from real life it'll be frustrating. 2 (less likely): Charlotte angrily listing W Makepeace Thackeray's faults to his face as she was ""moved to speak to him of some of his short-comings (literary of course), one by one the faults came into my mind and one by one I brought them out and sought some explanation or defence""
* "When the clerk came with the message to see him, (publisher) Smith sent out to ask for their names which the Brontës declined to give, saying they had come on a private matter. Ever corteous, Smith concealed his impatiance and went out to meet the two "rather quaintly dressed little ladies, pale-faced and anxious-looking", who were waiting for him. An amused Charlotte later reported their first meeting. 'Is it Mr Smith? ', I said, looking up through my spectacles at a young, tall, gentlemanly man. Annoyed to discover 200 pages into The Tenant of Wildfell Hall that I've been reading a completely abridged edition.